This weekend, one of my favorite bets is back. The Kentucky Derby Future Wager (Pool 1), which runs from Feb. 10-12, provides insightful gamblers with the opportunity to lock in some great prices on potential Derby starters. The pool consists of 24 wagering interests — 23 individual entrants and the mutuel field, which is comprised of all the remaining eligible three-year-olds. Because it is a pari-mutuel bet, the Derby Future Wager odds tend to be much fairer than those offered by most sportsbooks and casinos. Better still, there’s an easy way to make money on the bet — simply play the field. 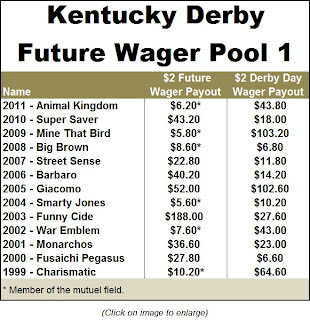 In the 13 years the Kentucky Derby Future Wager has been offered, this strategy has been successful nearly half the time and has produced an ROI of — get this — 69.2 percent in Pool 1. However, for those of you who are married, I’m going to warn you in advance: use different wording if your spouse asks you about the money you bet. When I explained to my wife that the $100 credit card charge she discovered was used to “play the field,” she got very upset — accused me of cheating. Of course, such a notion is ridiculous. 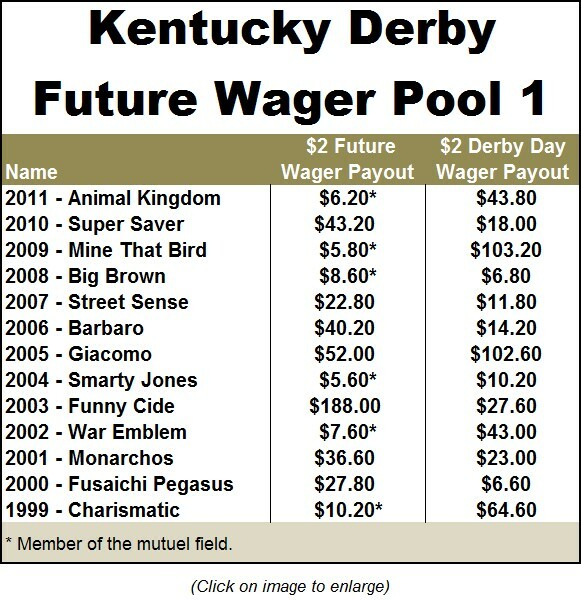 The Kentucky Derby Future Wager is offered through TwinSpires.com and is completely above-board and legal… but I learned my lesson. This year, if she asks, I’m going to tell her I spent the money on “exotics,” which is racetrack-speak for non-traditional wagers, like exactas and trifectas. That should thwart any arguments. On the plus side, this guy has looked very good in limited action (just three lifetime starts). On the negative side, trainer Todd Pletcher is woeful 1-for-29 in the Derby — his lone win coming with the far more seasoned Super Saver in 2010. I don’t see any value at 8-1. Like Algorithms, Alpha is a son of Bernardini, but unlike his more fancied rival, I think the Godolphin charge is a must-use in Pool 1. His races in New York this year have been fantastic and he appears to be getting better and better. 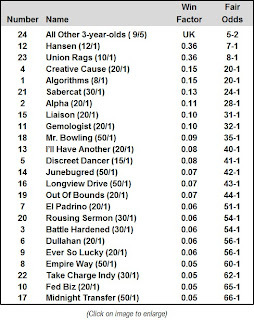 I liked the son of Giant’s Causeway in the Sam F. Davis, but let’s be honest: he didn’t beat a whole lot. The 91 Brisnet Speed Figure (BSF) and -6 LSR he earned in that race were decent, but I need to see a whole lot more. This colt hasn’t demonstrated the great turn of foot I like to see in Derby horses, but he has raced well against the best of his generation. Let’s see how he does when he makes his three-year-old debut. Lightly-raced, with sprint breeding, a ton of talent and Todd Pletcher training… could be this year’s Quality Road. Son of Even the Score is definitely one to keep an eye on. I love Derby contenders with proven ability to motor on the final turn — last year, Animal Kingdom went from seventh to fourth and gained two lengths turning for home in the Spiral Stakes — and this guy did just that in the 2011 Breeders’ Futurity at Keeneland. Earned a huge 111 BSF in an optional claiming event at Gulfstream Park on Jan. 29 and also showed ability as a juvenile… another must-use. Colt still has a lot to prove. He’ll need to be to wear the roses, based on what I’ve seen so far. Excellent -10 ESR in his maiden win on Dec. 30 — especially since he’s bred to go longer. It’s still too early to tell whether or not he’s a legitimate Derby horse, but he’s got the best Derby trainer (Bob Baffert) in the business. Showed he could come off the pace in the Kentucky Jockey Club Stakes at Churchill Downs in his final start as a two-year-old… another top contender for trainer Todd Pletcher. Clearly, this son of Tapit must be considered given his stellar juvenile campaign. However, I was not at all impressed by his three-year-old bow, as it confirmed the issues — well, issue (singular) — that Hansen faces: he must learn to rate. Don’t get me wrong, his early speed is a great commodity, but it needs to be utilized in a sensible fashion. Although it may surprise some to learn that three of the last four Kentucky Derby winners recorded ESRs of -10 or lower in their final preps, it should be noted that all three of those Derby champs — Big Brown (2008), Mine That Bird (2009) and Animal Kingdom (2011) — came from off the pace on the first Saturday in May. Looks more like a sprinter/miler type than a 10-furlong horse to me. Appears to be improving, but has a ways to go. Not sure what effect the traffic issues he encountered in the Robert B. Lewis will have on the Bob Baffert trainee going forward, but his juvenile form makes him a contender. Pulpit colt is a lot better than most people (or at least morning-line maker Mike Battaglia) seem to think. Yeah, his run in the Sham left something to be desired, but check out the bid he made in the Delta Downs Jackpot on Nov. 19. Similar late-running tactics in the future might be just what the doctor ordered. Unproven over a route of ground; I’m adopting a wait-and-see attitude. He’s in great hands and appears to have ability; a definite contender. Even though he won the Sham and beat a horse that I think has talent, I’m not convinced this guy will continue moving forward. On one hand, he has lots of experience with seven lifetime starts already; on the other hand, I haven’t been overly impressed by any of his efforts (both of his wins came versus California-breds). Since breaking his maiden, this Steve Asmussen charge has looked like a champion, with easy wins in the Garden State at Monmouth Park and the Grade III Delta Downs Jackpot at — you guessed it — Delta Downs. The latter race was particularly impressive, as the son of Bluegrass Cat (second behind Barbaro in the 2006 Kentucky Derby) came from last-place to score by four lengths. Well-bred with a lot of upside, this colt is one to keep tabs on. Although his breeding is somewhat questionable, it’s hard not to be impressed by what this Dixie Union-Tempo colt has accomplished; the clear early Derby favorite. Obviously, if the price is right (see below), bettors have to select this option on the majority of their tickets. Since 1999, a $1,000 win bet on the field every year, would’ve produced $9,000 in profits. 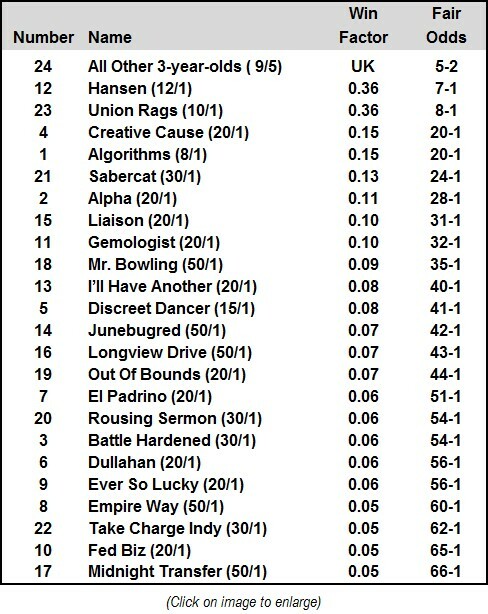 BET(S): WIN on 2, 6, 7, 12, 16, 18, 21, 23 and 24 at or above their fair odds above.